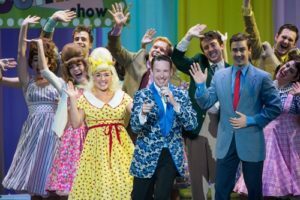 Kansas City and Starlight Theatre proved in the opening performance of “Hairspray” that even beside a two-time Tony Award nominee and other professionals, our local talent can and does stand toe-to-toe with the best. For the theatre regulars, the July 27 opening confirmed what many know–Kansas City boasts a plethora of talent. 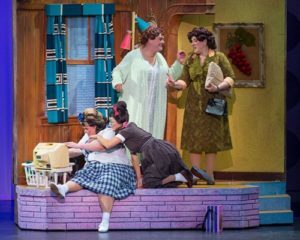 “Hairspray,” always a crown pleaser again proved why it ranks among the most popular Broadway shows in history. 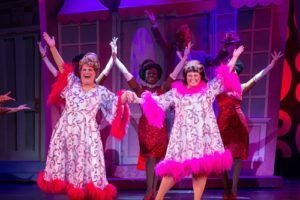 The lively musical score, the bright costumes, the spirited choreographed dancing, the theme of an overweight girl winning against the odds, and a lead actor performing in drag all add up to a spectacular show. 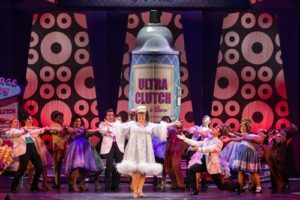 Statistically, “Hairspray” won eight Tony Awards®in 2003, Hairspray returns to Starlight Theatre for the first time since 2006. 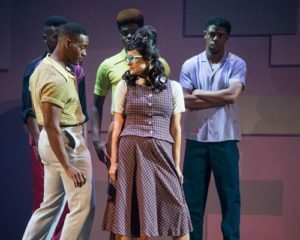 Featuring such beloved songs as “Good Morning Baltimore,” “Welcome to the 60’s,” “Without Love” and “You Can’t Stop the Beat,” this feel-good musical highlights the importance of self-love and inspires audiences to dream big. Taking on this audience pleaser, Starlight selected Jerry Jay Cranford to cast and direct Starlight’s sole local production this summer. 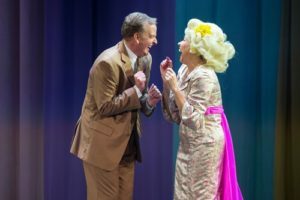 Brad Oscar, gives a Broadway-worthy lead performance as Edna Turnblad, mother of teenage Tracy Turnblad, performed with eager enthusiasm by KC’s Jessica Alcorn. 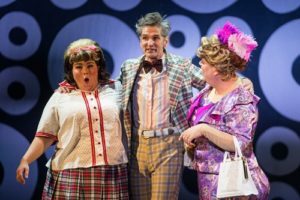 Broadway veteran and two-time Tony Award nominee Brad Oscar leads the cast in the iconic role of Tracy’s mother, Edna Turnblad. Oar’s most notable Broadway credits include “The Producers” (Tony nomination), “The Addams Family,” “Big Fish” and most recently “Something Rotten!” (Tony nomination). 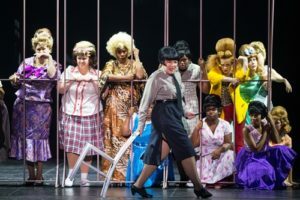 Although it debuted on Broadway nearly two decades ago, “Hairspray” continues to be one of the most widely produced shows across the U.S. today. 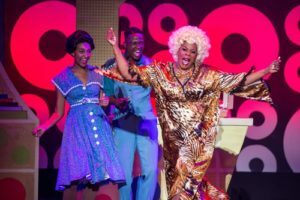 The musical’s beautiful messages of acceptance and progress make “Hairspray” a timeless production, highlighting the importance of self-love and inspiring audiences to dream big. “Hairspray” opened on Broadway on August 15, 2002. he original Broadway production ran for more than six years, closing on January 4, 2009,after 2,642 performances. In a pre-show taped interview, Cranford tells the audience that he wanted Oscar for Edna and had known him from his time as a Broadway performer before returning to Kansas City. His hunch proves perfect. Oscar shines as Edna and leads the production with his strong stage presence and his chemistry among the other members of the cast. After auditioning and ultimately winning a role with a popular TV show’s dance company, Tracy becomes an overnight sensation and uses her newfound influence to advocate for racial integration. With the help of her fellow cast mates, Tracy tries to change the world, dethrone the reigning Teen Queen and win the affections of teenage heartthrob, Link Larkin, all without denting her ‘do! Co-stars of the show, Oscar and Alcorn commanded the stage and sent waves of electircity throughout the spacious Starlight audience. While they were on fire, so, too, was the rest of thc cast. Energy on stage sent chills and enthusiasm throughout the amphitheater. From the audience one could tell the cast was ready to perform and create memorable theatre magic. Give credit to the supporting cast lead by Cathy Barnett as Velma, a singing villain as mean as any character one might find in a Disney animated feature (save Cruella DeVille). Barnett delivers the boastful, singing villainess with comedic timing and tone. Barnett was aided by a stunning, never-in-style wig and costumes very over-the-top to match her performance. Four other standout performances came from Steven Scott Wormley as Seaweed. His dance moves predominately kept eyes focused on him when he was on stage. His singing part also accentuated his character. Regina Lavers as Motormouth Mabel stopped the show twice with her two vocal performances. Both could have brought standing ovations in the body of the show. They were that good. “I Know Where I’ve Been” brought cheers, screams, and thunderous applause. Katie Karel as Penny Pingleton gave a really funny side-kick to Tracy Turnblad’s character. While Tracy was determined, a socially awkward Penny provides the comedic opposite to Tracy’s dominate character. As the love interest, Eric Geil sang and danced his way into Tracy’s heart and the audience as well. The chemistry between Tracy and Link give the show the heart and create audience buy-in. The Blue Star Teen Ensemble in “Hairspray” is comprised of eight talented high school performers whose schools participate in Starlight’s Blue Star Awards program. The ensemble members and their high schools are: Janie Carr (Shawnee Mission East), Joey Ferguson (Lee’s Summit), Katie Hulla (Saint Thomas Aquinas), Holly Jackson (Shawnee Mission West), Amari Lewis (Sumner Academy of Fine Arts and Sciences), Katie Venteicher (Saint Thomas Aquinas), Megan Walstrom (Shawnee Mission East), and Savanna Worthington (Shawnee Mission East).